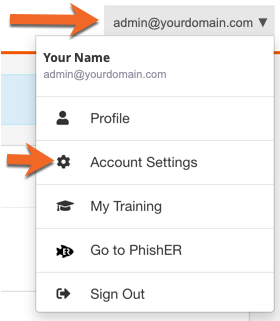 You can set up multiple instances of the Phish Alert Button (PAB) for your organization to define unique settings (prompt messages, languages, or other) for specific end users. Adding another PAB instance provides you with an additional license key for your new instance and a new set of editable settings. Why might an organization want to have multiple PAB instances? Typically, multiple instances are not necessary. Large or multinational organizations may find this to be a very helpful option, however. Additional PAB instances will let you have as much PAB customization as you want to with as many groups as you want to. Your installation method will vary depending on how you plan to use your multiple PAB instances and whether or not you've already set up a single instance. The most important thing to remember is to be sure you're using the correct PAB instance's license key for the instance that you'd like each set of users to have. 1) Log in to your KnowBe4 account. 2) Click your email address on the top-right of the screen and then click Account Settings. 3) Scroll down to the Phish Alert section. 4) Click the Add Phish Alert Instance button. 5) Click Confirm on the prompt that appears. 6) You'll see a new set of Phish Alert Settings you can edit. Included with your new settings is a unique license key that you can use when installing the Phish Alert for the users who need to utilize this particular instance. Repeat steps 1-6 for additional PAB instances as needed. You should name each additional instance of the Phish Alert Button uniquely. 8) When you access your Account Settings in the future, your PAB instances will be collapsed on your Account Settings page. You can click any instance's name to expand the settings for that particular instance. 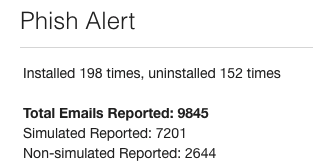 The Dashboard area of the console presents an overview of your entire organization's Phish Alert Button activity. The totals you see here will include all instances of the Phish Alert Button that you've installed.